Hannan junior Dalton Coleman releases a throw back to the pitcher during an April 30 game against Ironton Saint Joseph at the Craigo Athletic Complex in Ashton, W.Va.
Wahama junior David Hendrick releases a pitch during a May 10 baseball contest against Williamstown in Williamstown, W.Va.
CHARLESTON, W.Va. — Well represented. 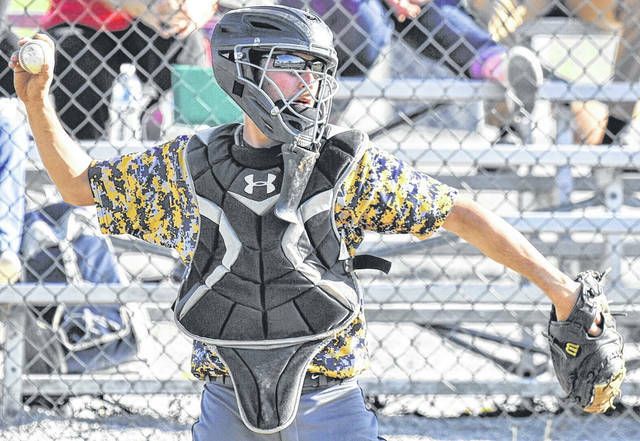 Mason County landed five players on the West Virginia Sports Writers’ Association Class A all-state baseball teams for the 2018 campaign — as voted on by a select panel of media members throughout the Mountain State. 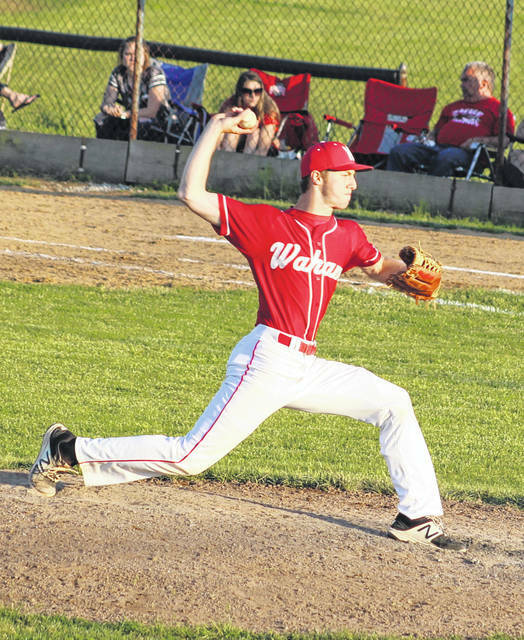 Dalton Kearns, Tanner Smith and David Hendrick each garnered all-state accolades for their efforts this past season at Wahama, while Hannan had a pair of selections in Kevin Morehart and Dalton Coleman. Both Kearns and Hendrick — a senior and junior, respectively — were repeat honorees on the Class A squad, while Smith, Coleman and Morehart all came away with their first all-state baseball honors during their junior campaigns. Kearns — a three-time all-state recipient — was chosen as a second team infielder after leading the White Falcons with 39 hits and a .459 batting average to go along with a .536 on-base percentage. Kearns — who also led WHS with 41⅔ innings, four wins and 46 strikeouts — was a special honorable mention selection as a junior and honorable mention as a sophomore in 2015. Smith was a special honorable mention choice this after producing team-bests of two homers and 33 RBIs. Smith was also 3-1 overall and struck out 40 over 30 innings of work with a 2.33 ERA. Hendrick was chosen to the honorable mention list for a second straight year with a .373 average that included a homer, 28 RBIs and a team-high eight triples. Hendrick also had a 2.96 ERA in 23⅔ innings of work while striking out 28. Both Coleman and Morehart — a catcher and pitcher, respectively — were chosen for their efforts as battery mates this spring. Season statistics were not available for either individual at press time. Ravenswood senior Chase Swain — a utility pick — was named the first team captain, while St. Joseph senior John Piaskowski — an outfielder — was chosen as the second team captain. Pitchers: Garrett Haggerty, Moorefield, Sr; Doug Clark, Wheeling Central, Sr; Charlie White, St. Joseph, Sr.
Catcher: Dominic Martin, Charleston Catholic, Sr.
Infielders: Tyler Wright, Madonna, Sr; Brett Riffe, Greater Beckley Christian, Sr; Bradan Mullenix, Williamstown, Sr; Logan Wells, Wheeling Central, Sr.
Outfielders: Pat Mirandy, Magnolia, Jr; Mason Adkins, Williamstown, Sr; Jacob Hensley, Sherman, Jr.
Utility: Chase Swain, Ravenswood, Sr (captain); Lenny Washington, St. Joseph, So; Garrett Matherly, Greater Beckley Christian, Jr; Jacob Hufford, Charleston Catholic, Fr. Pitchers: George Cupp, Wheeling Central, Sr; Luke Daugherty, Tyler Consolidated, Sr; Jordan Brown, Gilmer County, Sr.
Catcher: Ian Smith, Wirt County, Sr.
Infielders: Ty Sturm, Parkersburg Catholic, Jr; Dalton Kearns, Wahama, Sr; Sam Wykle, Summers County, Jr; Blake Bennett, Ravenswood, Sr.
Outfielders: John Piaskowski, St. Joseph, Sr (captain); Jake Ours, Moorefield, Sr; Garrett Scott, Cameron, So. Utility: Elias Gordon, Notre Dame, Jr; Brandon Combs, Charleston Catholic, Sr; Brett Tharp, East Hardy, Sr; Logan Frantz, Fayetteville, So. Sam Bosley, Greater Beckley Christian; Tanner Buchanan, Greater Beckley Christian; Tristan Coots, Fayetteville; Jordan Dempsey, Fayetteville; Tucker Lilly, Summers County; Nick Gipson, Valley (Fayette); Thomas Blaydes, Charleston Catholic; John Hufford, Charleston Catholic; Marshall Pile, Charleston Catholic; Brent Moran, Moorefield; Blake Watts, Moorefield; Hayden Baldwin, Moorefield; Clay Skovron, East Hardy; Addison Rexrode, Pendleton County; Timothy Thorne, Pendleton County; Kole Puffenberger, Pendleton County; Jake Gamble, Magnolia; Leo Herrick, Magnolia; Kolton Elliott, Paden City; Angelo Gentile, Wheeling Central, Pat Brown, Wheeling Central; Trey Scott, Cameron; Trin Scot, Cameron; Andrew Anglin, Ravenswood; Tyler West, Tyler Consolidated; Nick Cavins, Doddridge County; Bradley McHenry, Gilmer County; Hunter Hickman, Wirt County; Devin Williams, Ritchie County; Eric Williams, Tolsia; Hunter Eplin, St, Joseph; Luke Beatty, Madonna; Brent Robinson, Notre Dame; Todd Griffith, Notre Dame; Brandon Gray, South Harrison; Kyle Sturgill, Tug Valley; Brett Smith, Tygarts Valley, Hunter Lanham, Tygarts Valley; Taylor Jarrell, Van; Tanner Smith, Wahama. Cole Kipps, Greater Beckley Christian; Hunter Rinehart, Fayetteville; Dustin Bailey, Fayetteville; Nick Gipson, Valley Fayette; Brendan Lanham, Charleston Catholic; Preston Tucker, Buffalo; Jarrett Wiseman, Valley Fayette; Brendan Lanham, Charleston Catholic; Preston Tucker, Buffalo; Grant Evick, Pendleton County; Thomas Davis, Pendleton County; Lane Ours, Moorefield; Isaac Van Meter, Moorefield; Will Nice, Magnolia; Trey Slider, Paden City; Adam Murray, Wheeling Central; Tanner Lett, Doddridge County; Patrick Copen, Parkersburg Catholic; Leewood Molessa, Williamstown; Jack Hadley, St. Marys; Cullen Cutright, Williamstown; Jacob Hoyt, St. Marys; Connor Frye, Ritchie County; Lakin Tucker, Ravenswood; Cory Sweeney, St. Joseph; Dillon Pride, Clay-Battelle; Lucas Smith, Greenbrier West, Peyton Brown, Greenbrier West; Dalton Coleman, Hannan; Kevin Morehart, Hannan; Nick Paul, Madonna; Matt Thompson, MountView; Sam Romano, Notre Dame; Andrew Rogers, Notre Dame; Michael Coffey, Richwood; Noah Dyer, South Harrison; Landon McFadden, South Harrison; Logan George, Tygarts Valley; Caleb Price, Van; David Hendrick, Wahama.